GYPSY UPDATE: HELLO FROM AUSTIN, TX! favorite for urbanites looking for an easy escape from their daily grinds."
. . . an easy escape from our daily grind . . . That is exactly what we both need right now!! We're finally on the road for our Winter 2009-2010 trip, which was delayed by two weeks for medical reasons. I was starting to feel like a rat in a maze of doctor's offices and testing sites. After one final curve ball that came out of nowhere on our last day in Roanoke -- requiring yet another high-tech scan to rule out some sort of malignancy on one of my lungs, for goodness sake -- it was time to leave. Stop the merry-go-round! I want to get off! We literally pulled out of the driveway within an hour of getting the results that a suspicious nodule was "only scarring" and wouldn't require a biopsy. How they found the nodule in the first place is a long story. These "Gypsies" don't like to stay in one place too long, but sometimes practicality (medical continuity, in this case) requires it. If I'd needed a biopsy, we might still be in Roanoke and not enjoying the solitude of McKinney Falls State Park in Texas. The main packing for this three- to four-month foray to the Southwest took parts of three days. We waited until close to the day of actual departure because it was such a moving target this time. 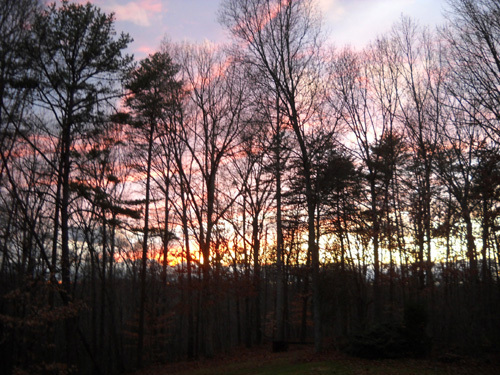 from our ridge on the last evening at our house (next photo, too). We have duplicates of many items that we take on these expeditions, so not everything gets carted inside and back outside each time we come and go from our house. But there's still a lot to haul up and down stairs and neither of us is in a position right now to do a lot of that -- Jim because of his sore foot and hand, me because of my granny knees. Jim's got the drill down more efficiently than I do but both of us rely on lists we've refined over the years to make sure we don't forget something important, especially things that would be expensive to duplicate. Each time we head out my list of "necessities" gets a little shorter as I learn that some of the things I'd like to take -- particularly heavy food items and supplies -- are better purchased along the way. Jim's been nagging me about this for years. He's right, because the less weight we're hauling in the camper, the better our gas mileage will be and the less wear and tear will occur on the camper and truck. My rationale has always been to haul extra items I've already purchased at a low price in Roanoke, assuming we'll have to pay more somewhere else. Besides, we've already paid for them! Jim finally convinced me of the folly of that reasoning when he reminded me that we almost always buy food and supplies at WalMart and Sam's Club, whether we're at home or on the road. Those stores are everywhere. (They will be this trip, but they aren't convenient in the summer in Leadville and Silverton, CO.) And the extra items that we leave behind can be used when we return. We always keep a good supply of non-perishables in the house for emergency situations. He's right. I'm not sure that taking less laundry detergent, fewer canned goods, etc. improved the gas mileage by very much on the way to Texas, but at least there was less to carry out to the camper! Cody was as excited to finally hop into the truck on the morning we left the house as Jim and I were. He'd been watching us haul stuff out to the camper for days, and he knew exactly what was going down. He clearly understands the word "camping," just like he knows d-o-g spells "dog." (We can't spell "supper" either; he knows that one, too.) He's smart. And he loves to go anywhere we're going. When the camper is involved, Cody knows it's going to be more than just a trail run or shopping trip -- it'll be an adventure. He's part Gypsy, too. When we drive across country in November or December we run the risk of encountering dangerous wintry weather. So far we'd had no snow in southwestern Virginia. Last year the first snow fell at our house much earlier than normal, in mid-November -- on the very morning we left town. This time the worst we expected was some rain along the way to Austin, Texas, a way stop to break up the long drive to Arizona. 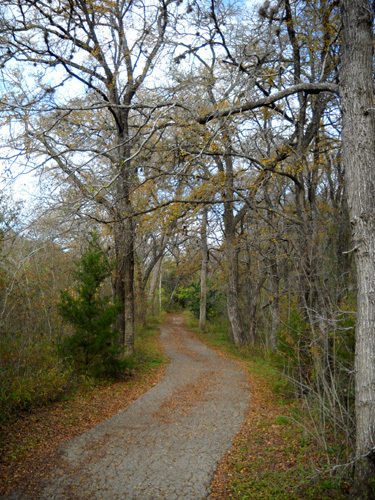 Early December in Austin, TX: a mix of pines and deciduous trees. 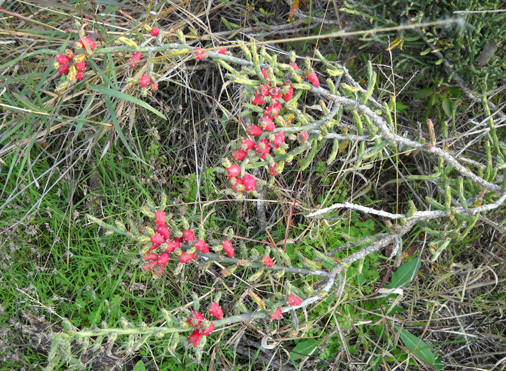 In the remaining photos, note the grasses that are still bright green. We followed the same route as last November when we aimed for the campground at Fort Hood (wonder what it's like to camp there this winter, after the recent massacre on post?). This time we went just a little farther south to the Austin area. It took us two ~ 9-hour days and one 5�-hour day to reach our destination. Those are reasonable hours that don't leave us exhausted at the end of the day. Good roads, decent weather, minimal construction, and moderate traffic with no accidents delaying us were also helpful. Even though I hadn't driven our Ram 2500 truck for several weeks, it was easy to get behind the wheel again and take off down the highway; it is so much quieter, smoother, more powerful, and easier to maneuver with the camper than our old F-250 was. I was a little concerned that most of the rest areas along our route would be closed. I know various states, including Virginia, are closing some of their rest areas to save money during the current economic recession/depression. We were pleased to see that most of the rest areas we passed were open, and we stopped at a couple of them to fix lunch and let Cody run around in the grass. It takes us at least half an hour to reach 1-81 west of Roanoke from our house. We followed it southwest through Virginia and into Tennessee, then merged into traffic going westbound through the Volunteer State on 1-40. The first day was the hilliest (and most scenic, even with the leaves down) through the southern Appalachian Mountains. We spent the first night at a WalMart west of Nashville where we stayed on our trip west two years ago. We covered 479 miles that day. The second day we continued on 1-40 through western Tennessee, drove diagonally through Arkansas on 1-40 and 1-30, and stopped for the night at another familiar WalMart near New Boston, Texas, about 25 miles inside the NE corner of the state. We covered 512 miles that day. That left just 367 miles for the third day. We continued on I-30 toward Dallas, followed I-635 and I-20 around the southeast metro area, and hung a left on I-35 south. The road looked familiar until we got south of Temple, TX near Fort Hood. Neither of us has ever been to Austin before, so it was fun to drive through some new territory. 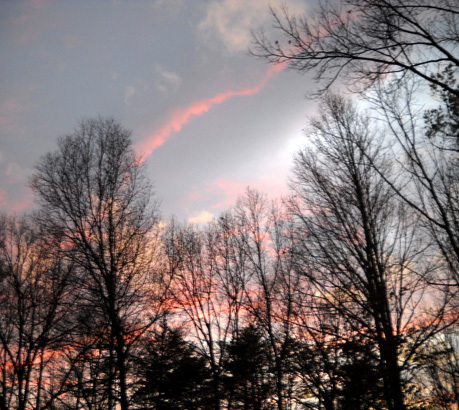 Most of the trees were bare through southern Virginia and across the width of Tennessee. South of Little Rock, Arkansas we were far enough south that an increasing number of trees were still colorful; some looked like Bradford pears, which were still partly leafed out in the Roanoke area when we left. Fuel prices were a little higher this November/December than last year but instead of getting cheaper as we headed west, they got a little more expensive this time. Jim filled the tank with diesel in Roanoke for $2.59/gallon the day before we left. The lowest prices we found through southern VA and across TN, AR, and TX ranged from $2.61 to $2.66 at WalMarts and Flying Js, using both company's shopping/discount cards with our credit card. The highest price ($2.79) was at a Love's station; we don't have their discount card. Last year we paid more than the price above in Roanoke but about 10� less per gallon in the other three states as we headed west. However, because the Ram gets better gas mileage than the old Ford truck, we paid less out of pocket to drive a little farther into Texas this year. Both years were much less expensive than in December of 2007. For that we are grateful. 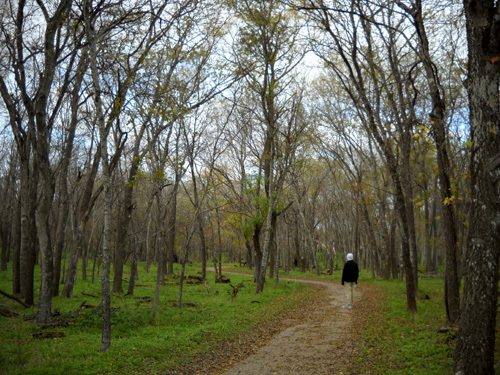 We are big fans of the Texas State Park system. If you've read our winter journals from 2007-8 and 2008-9 you know we've enjoyed camping at Huntsville SP several times. We like HSP so much, we spent the entire month of February there this year. We've also camped several nights at Galveston Island SP (in January, 2008, before Hurricane Ike devastated it) and at Mustang Island SP in January of this year. During this recession/depression, states like California that are in dire financial straits have been closing or threatening to close their parks to save money. Besides other more important repercussions (like folks losing their jobs), it has affected some ultra trail races that have been cancelled or relocated. Texas has done the opposite. It hasn't added any units to its extensive system of over 90 state parks and historic sites, but in 2008 the legislature appropriated over $180 million in additional park funding for improvements to the infrastructure, increased staff, and more programs. I think that is remarkable in this economic climate. One project we know about first-hand is adding sewers to the campsites at Huntsville State Park this winter. We look forward to that amenity when we return there in January. Many states that are not closing parks are increasing their rates for entry, camping, and use of facilities. Not only are camping fees very reasonable at Texas' state parks, I don't believe they have increased this year -- even at Huntsville SP after the improvements made this winter. 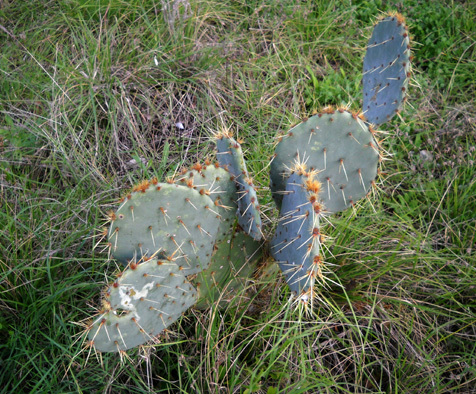 Pencil Cactus( ?) 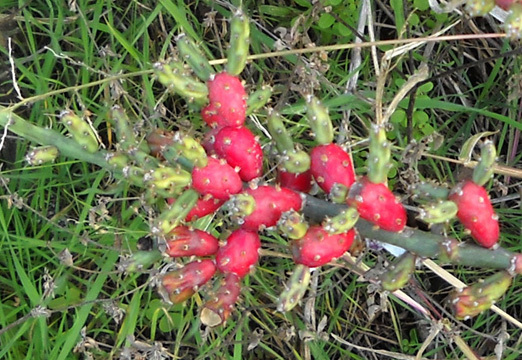 at McKinney Falls SP looks very Christmas-y growing above bright green grasses. Camping fees are even more reasonable at Texas parks that have weekly rates (seven nights for the price of six) -- and with the four discount coupons you can get if you purchase the annual state park pass. The main savings with the pass, however, come from the free entry fees, which usually cost $4-5 per person per day in addition to the campground fees. That can really add up. We made out like bandits last year with our first $60 pass. By purchasing it on February 1, 2008, it was good for a whole thirteen months, not twelve -- until the end of February, 2009. In that span of time we used it to stay at Huntsville SP three times for a total of about two months, plus almost two more weeks at Galveston and Mustang Islands. I can't quickly find the entry from earlier this year where I tallied up our total savings in entry fees and discounts, but it was probably over $400. 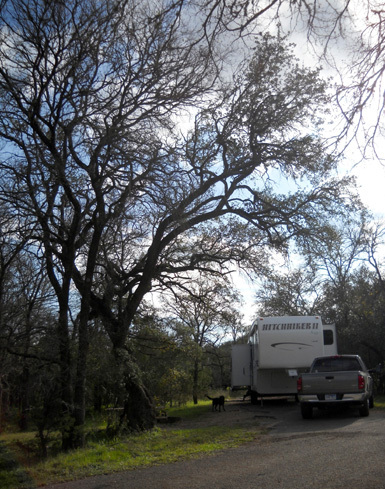 That pass expired at the end of February so we purchased another one when we arrived at McKinney Falls State Park this week. It's still only $60 and with daily entry fees here that cost $5 per person, we'll pay it off after only six days; we're here for eight days. We also plan to stay at Huntsville SP up to a month in January-February, and may camp at one or more state parks before and after that for several weeks. We plan to be back in Texas next November and December. This pass, which is good through the end of December, 2010, will give us free entry to each park each day. Ka-chink -- more money saved! Flipping through the attractive 112-page color booklet that comes with our pass, we're practically drooling over all the interesting places to camp in Texas. OK, they aren't as spectacular as most of our national parks, but they are very impressive for state parks. 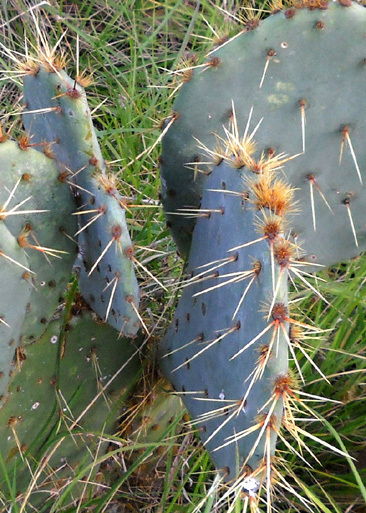 Texas is so large and the terrain so varied that you can camp near white sandy beaches on the Gulf, near rugged canyons or mountains, in dry, sandy desert or moist, green "piney woods," or near wetlands full of migrating birds. When we get our more permanent pass in the mail in a few weeks, it will have four coupons worth 50% off one night's camping fee (worth $8-10 each for a total of $32-40) and additional discounts for goods and services within the parks. These passes are a great deal for Texas residents, vacationing couples and families, and RVers who hit the road for weeks or months at a time. This type of camping is not free like the boondocking we do in Colorado during the summer but it's a reasonable alternative in the winter when it's tough to find free national forest and BLM sites in warm places. Besides, sometimes it's nice to have the convenience of water and electric hookups, picnic tables, and grills at our very own site, and nearby dump stations and bathrooms with running water and showers -- at a much lower cost than most private campgrounds charge. Several months ago when Jim was researching potential races to add to our winter schedule, he found a little-known fixed-time race called Run Like the Wind in Austin. Its location, date, and varied time options were all good for our last planned race of the year, the 24-hour race in Phoenix which will replace Across the Years on December 31. 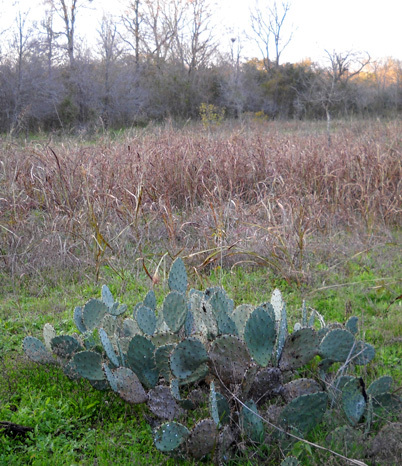 Further research into camping options yielded an urban state park (very unusual! 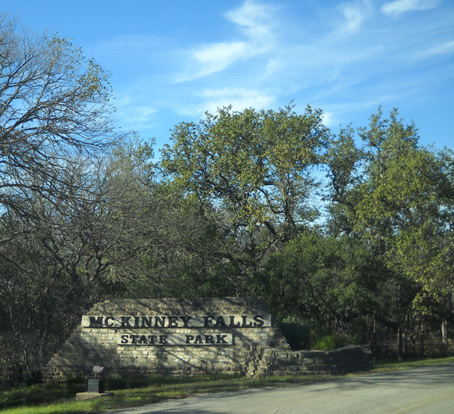 ), McKinney Falls, that fit our needs. 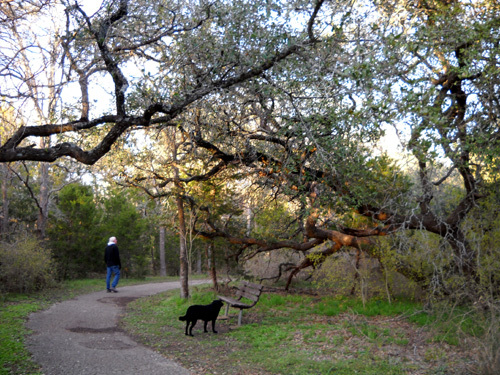 We also considered a new 50K the same date in early December that partly replaces the defunct Sunmart races at Hunstsville State Park, a two-hour drive east of Austin. We made reservations at both parks, knowing we could modify them when we decided which race we would run. Nice place to chill for a while . . . It was a good decision -- we love it here! We found a nice campsite with lots of privacy. 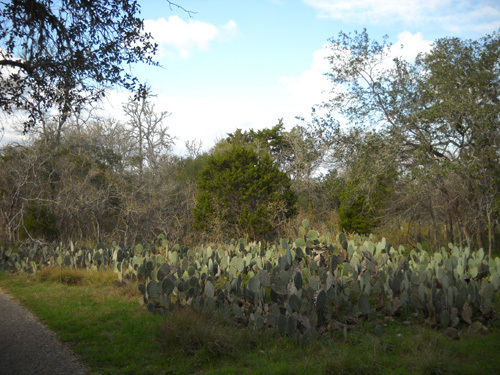 We're busy exploring the hiking and biking trails, old homestead buildings occupied by the former landowners, rock shelters used centuries ago by Native Americans, interesting limestone ledges, and scenic waterfalls. I'll talk more about the park in another entry, after we've had time to see all of it. LET'S GO SOUTH TO AVOID COLD TEMPS AND SNOW . . .
You know how we joke about leaving Virginia for a few months to avoid the "ravages of winter" there? We did get out in time to beat the first snowfall in Roanoke this time, only to discover that today Austin was supposed to get up to 2" of the white stuff. Remember, we came south to avoid snow. You should have heard Jim muttering!! I thought it was pretty cool. I envisioned a peaceful walk in the snowy woods near our campsite and throwing wet snowballs for Cody to catch. The snow would be very pretty, melt soon, and we didn't have to shovel it or drive in it -- we could just hunker down in our comfy camper and watch non-stop news broadcasts about the unusual event on TV. Austin rarely gets snow, especially this early in the season, so the reaction by locals in the 24 hours preceding the expected event was about like it is when snow threatens Atlanta (where I lived for 25 years): near panic mixed with excited anticipation. City workers were up last night prepping the streets, schools announced they would close early this afternoon, shoppers flooded the stores purchasing emergency supplies . . .
. . . and we got ZERO snow! Where's the snow?? By this afternoon, the sun was out and the storm clouds had moved east. Well, darn. A few snowflakes fell around Austin today but nothing stuck. The storm that dumped several inches of snow to the west, north, and east of us just skipped right over this fair city. Houston, which is even farther south, got a rare 3-4" of white stuff in some places. The storm looks like it's heading to the east coast now. Wonder how much snow Roanoke will get? Jim's happy that we didn't get any snow. I'm disappointed. We got gypped!! There's more irony, however. Now that the sky has cleared up, the predicted low temperature tonight in Austin is a bone-chilling 26� F. That's very unusual here, too. Heck, that's unusual in Roanoke. Good thing we have thick flannel sheets, warm fleece blankets, and two electric space heaters to supplement our propane furnace. We've never had problems with water pipes freezing in the camper as long as the interior is heated -- but we usually don't run into temps this low. Just adds to the adventure of camping!